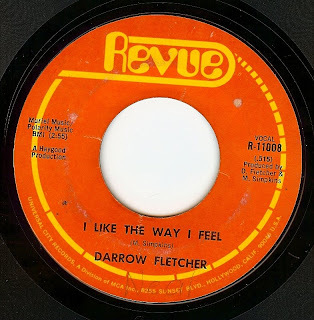 Darrow's career began before his voice changed (at age 15- see past 45 of the day "The Pain gets A Little Deeper") and he continued recording into the late seventies (although sporadically). I say this often, but I am truly amazed that Darrow never had a massive hit. The quality of material and his voice are top notch. This song has one of the most incredible choruses I've ever heard. It was recorded when he was all of 17 years old. While yesterday's entry was sublime, today's entry is merely ridiculous (but in that infectious garage rock way)! I know this band was from Memphis, but that's about it. If you don't want a song stuck in your head all day, don't click "play". But if you are a glutton for ear candy such as I, click away! 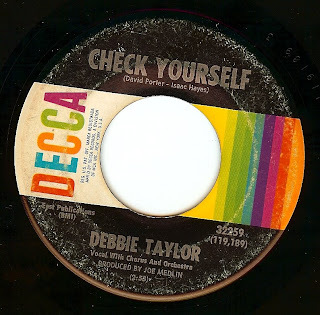 Cutting a mysterious figure (no known sightings since her last release in 1975), Debbie Taylor was allegedly discovered singing in church by a Decca records scout. This song has some of the most amazing vocals I've ever heard on a female soul track; her phrasing is very much in the style of Billie Holiday which is just dripping with raw emotion. Quite a record, and it was written by the Stax double dynamite team of Isaac Hayes/ David Porter! Here's one that was hipped to me very recently and I was pleasantly surprised! Don't know how it escaped my radar for so long (in addition to the other stuff I collect I always seek out interesting Beatles covers) and this exotic sitar driven piece of exotica is quite amazing. 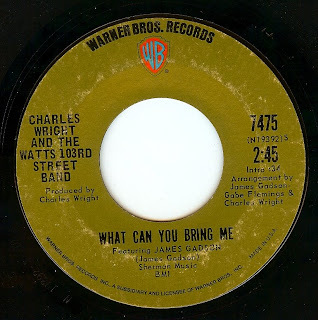 CHARLES WRIGHT & THE WATTS 103rd STREET BAND - WHAT CAN YOU BRING ME? It's been a while since I've featured some funkier sounds, and while trolling for today's selection, this greazy slab stood out. Mississippian Charles Wright's family moved to Los Angeles when he was young, and he became a staple on the L.A music scene, and the genesis of the 103rd Street band was built around Bill Cosby needing a band for his first vocal record. Through strange occurrences the funk was begotten! One of the first bands to play dead on the one, they were also one of the best and had a HUGE hit with the incredible "Express Yourself". This one is from a few years later and equally powerful. 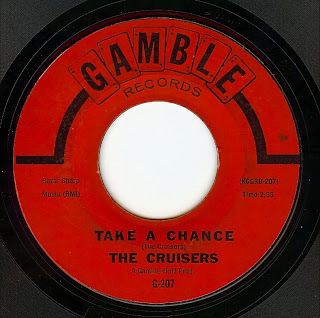 The Cruisers formed in Philadelphia the late 50's as a doo wop group, and released a few singles that went nowhere. In 1967, they were signed to the nascent Philly sound label Gamble and cut this record, which shows those beautiful harmonies that I'm such a sucker for. Another one that I just can't believe didn't go anywhere. 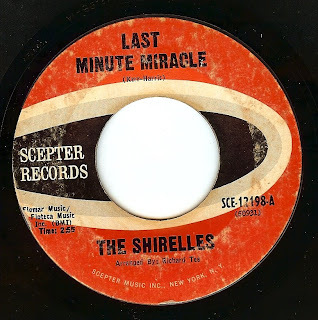 Named after their lead singers (Shirley Reeves), the Shirelles proved to be one of the best and most durable of all the girl groups, cutting such classics as "Will You Love Me Tomorrow", "Baby It's You", "Soldier Boy" and many other glorious girl group gems. The words "glorious" "girl group" and "gems" go together so well, and this is one of those songs that deserves those adjectives, and it was also the last (very minor) chart hit for this New Jersey group. 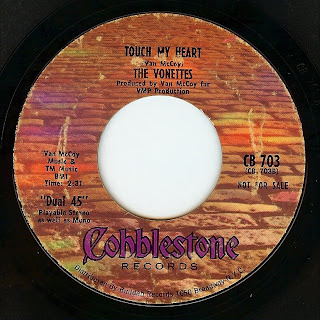 This beautiful deep soul track was the b-side of one of the Emeralds biggest hits ("Baby Let Me Take You In My Arms Again" which also hit the pop in addition to r&b charts). 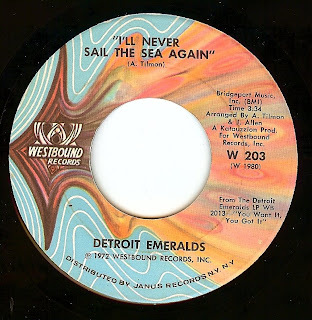 The Detroit Emeralds were, you guessed it, based in Detroit during their recording career (1968-1974) but all hailed originally from Little Rock, Arkansas. Thank you for the lifetime of wonderful music, Eddie. You will be missed and your music will be played as long as people have ears, can smile, or dance. 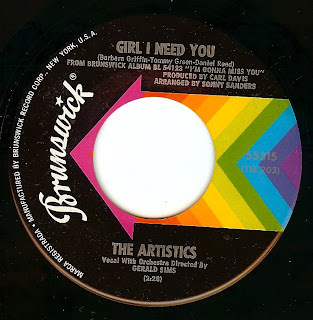 ...and what better to hear on a Thursday than the feel good sounds of Chicago soul, Artistics style! Discovered by Major Lance and produced by Carl Davis (two names we hear around these parts quite often! 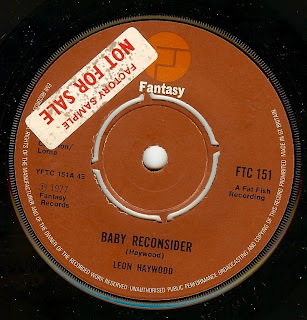 ), this Chicago group had a lovely run of records up until the early 70's. Hailing from Allentown, PA, Jay and The Techniques had a massive smash with "keep The Ball Rollin" in 1967, but were never able to hit big again after that 45. Here's one of the follow-ups that charted low but in my opinion is a superior record in every way (although "Keep The Ball Rollin" is an infectious hit, I don't think its' aged as well as this double sided classic). Both sides are stompers! For my taste, the b-side has a slight edge, but both sides are really great. Proving once again that not all amazing soul records will cost a lot of money! This one can usually be found quite easily for a few dollars. 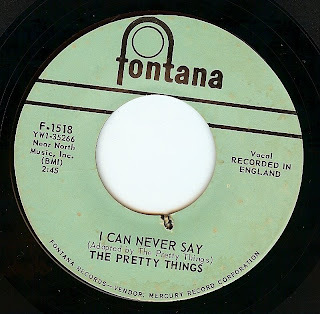 One of the best bands of the British Invasion, the Pretty Things never got the worldwide fame they deserved. Perhaps it was because they were just too far ahead of their time, in their ultra long hair and rebellious attitudes. I love how this track (which is actually a b side) mixes snotty vocals, acoustic guitar and swinging London beats. Perhaps this song was influenced by the then recently released "Beatles For Sale" album that had a bunch of acoustic based songs? What a great track, and above all, the Pretties strong R&B influences deliver the grit! Here's an absolute classic L.A soul track; quite possibly my favorite west coast soul tune ever! Featuring superb singer General Johnson (later of Chairmen Of The Board and "Give Me Just A Little More Time" fame) this anthem was recorded at a time that too many clueless music historians write off as the time between Elvis going in the army and the British Invasion music "died". Give me a break! Look at all the greatness of 1960-1964. The birth of Motown! Girl groups! Amazing r&b from New Orleans, Atlantic records! The birth of the Beach Boys! I could go on, but this song says it all. 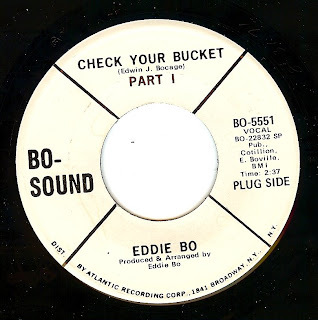 General, originally from Virginia but relocated to new Orleans, was only 18 years old when he wrote and cut this track, which hit twice (1961 and 1964). 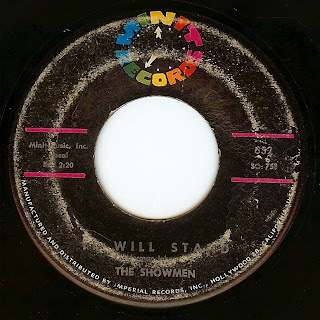 A few months ago I featured "Our Love Will grow", a later gem from the Showmen. Here we are in the middle of the week ("hump day" as they say here in the USA); I think this record will help everyone get over the hump! 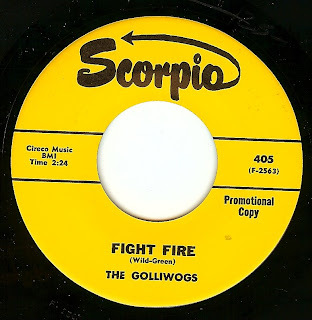 The Golliwogs were a California bay area band that released a handful of singles before changing their name to Creedence Clearwater Revival in 1967, losing the garage edge and releasing a string of hugely successful singles. This one, however, for my buck is their best ever (and I really do like most of the CCR stuff as well). I love hearing John Fogerty sing without the contrived southern accent, too. 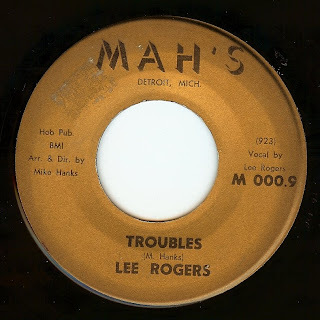 Here's another great one from the unsung "Prince Of Detroit" Lee Rogers. This was his first solo single, and did well locally (in Detroit) but, as I say far too often, never broke nationally. Hot guitar and sax drive this song into foot stomping territory! Oooh wee baby is this a heater! 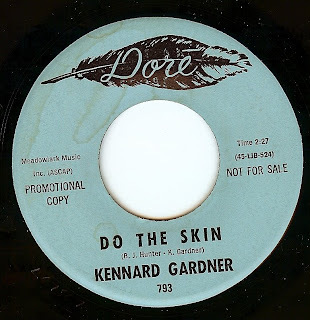 Unfortunately, I know nothing about who Kennard Gardner is/ was. Perhaps from Los Angeles, as Dore was an L.A label. Regardless, it's one smoking slab of vinyl. Here I am, sitting here wondering what today's post was gonna be and I couldn't stop thinking about yesterday's Major Lance posting. 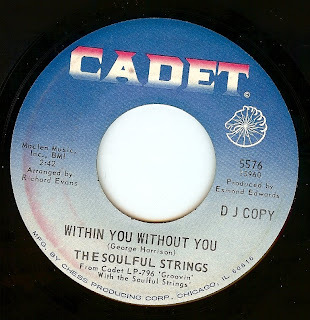 Then it brought me to how underrated Chicago soul can be when held within the likes of Detroit and Memphis. 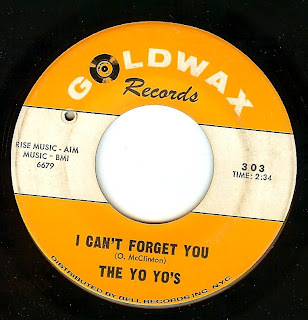 While it would be impossible to play favorites, so many of the records that move me the most were made by that incredible ring of Chi town folks that included Curtis Mayfield, Syl Johnson, Gene Chandler and all of the many artists the above produced or spawned. So here's a beautiful, late period Impressions track from right around the time Curtis Mayfield went solo. 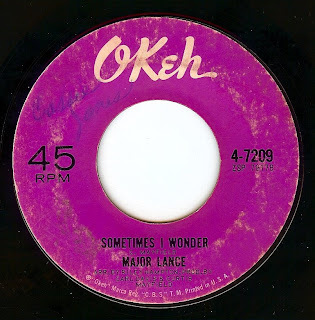 I know, I know...I just featured a Major Lance song recently...Lance was one of those people who I could feature once a week! 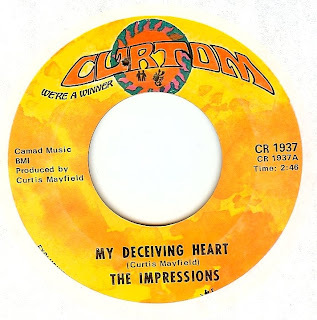 So many great singles, and on this track the backing vocals of Curtis Mayfield and the Impressions are loud and strong. Lyrically, this is a very interesting song as well. Another Chicago gem. 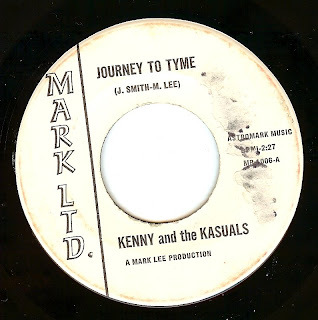 Starting out around 1963, kenny & The Kasuals became one of the busiest and best bands working in the north Texas teen dance/ fraternity circuit. 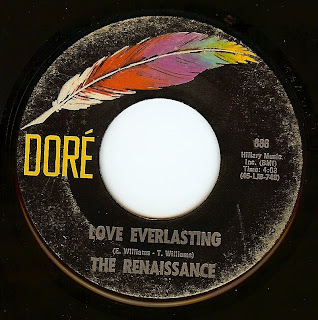 By 1964, their sound took on a strong r&b/ British Invasion influence, and the band found themselves becoming more and more popular and by 1966 they cut their first record, which was followed up with an LP that is one of the most collectable albums of the sixties. This, their second 45, is the stuff of legend. 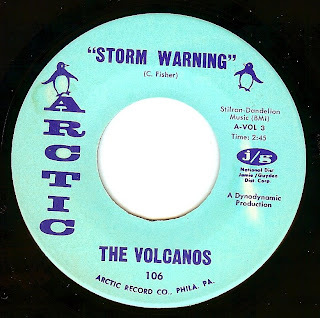 One of the wildest (as well as most musically competent) garage rock singles (while I dig quite a few of the legendary "garage" records, an equal number leave me cold due to poor musicianship). This record is an absolute monster, and the b-side is a great British invasion style song as well. This record was picked up for national distribution by United Artists, and while it was a hit in a few cities, it never broke nationally. In a city overflowing with talent (Philadelphia), it's no surprise that a few groups slipped through the cracks. It is, however, surprising that with releasing over a dozen quality singles, the Volcanos never had a breakthrough hit. This was the closest that they came, and for good reason. It's one of those records where everything clicks! 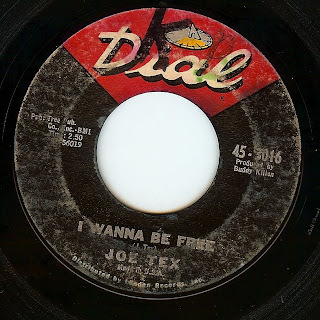 In the long line of "message" records (such as "Too Much Monkey Business", f'rinstance) Joe Tex eloquently handles the drudgery of the work day in this classic about, well, being free. This is one of those songs that epitomizes soul music, with its' strong gospel-meets-hard-rhythm sound. Born in either 1947 or 1949 depending on the source of info, Chris Bartley began singing doo wop in Harlem at a very young age and formed his first group in 1959. He was later picked up by genius producer Van McCoy and released a string of superb singles in the late 60's and all but retired around 1971. 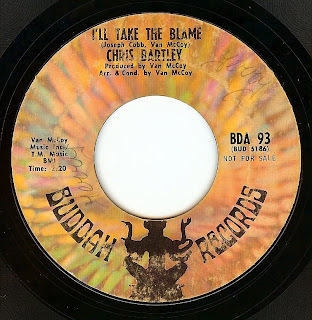 This is actually the b-side to a cover version of "Baby I'm Yours" (made famous by Barbara Lewis) which is simply OK; although producer McCoy was usually very clever in realising hit potential, I truly think he missed the mark on relegating this track to a b-side, as it is very catchy and in my opinion had great hit potential. This deep soul track goes so deep that there is absolutely no info to be found anywhere on this group! Even the label discography for Los Angeles based Dore Records cuts off a few catalog numbers before this release. The song is absolutely gorgeous and has haunting harmonies that most likely will stick in your head all day.